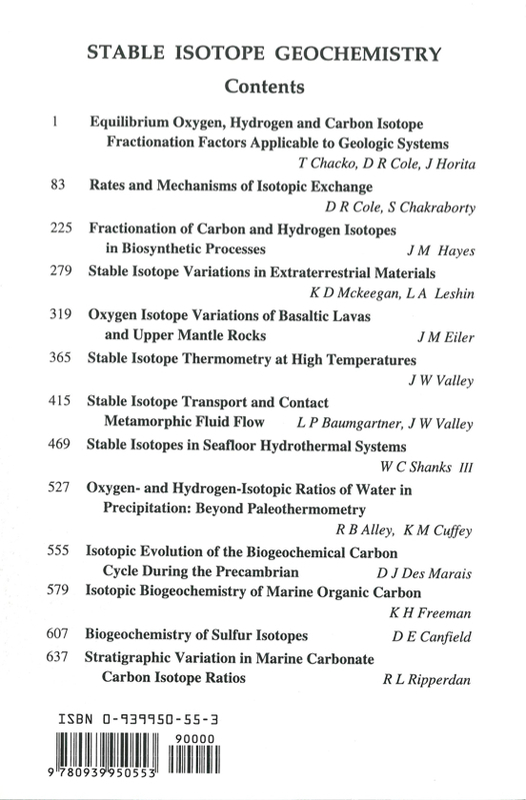 This volume was prepared for Short Course on Stable Isotope Geochemistry presented November 2-4, 2001 in conjunction with the annual meetings of the Geological Society of America in Boston, Massachusetts. 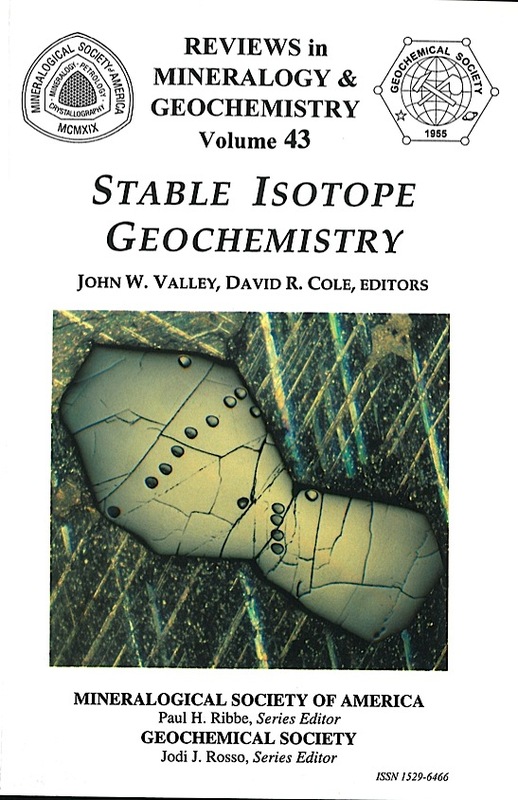 This volume follows the 1986 Reviews in Mineralogy (Vol. 16) in approach but reflects significant changes in the field of Stable Isotope Geochemistry. In terms of new technology, new sub-disciplines, and numbers of researchers, the field has changed more in the past decade than in any other since that of its birth. Unlike the 1986 volume, which was restricted to high temperature fields, this book covers a wider range of disciplines. However, it would not be possible to fit a comprehensive review into a single volume. Our goal is to provide state-ofthe-art reviews in chosen subjects that have emerged or advanced greatly since 1986. The field of Stable Isotope Geochemistry was born of a good idea and nurtured by technology. In 1947, Harold Urey published his calculated values of reduced partition function for oxygen isotopes and his idea (a good one!) that the fractionation of oxygen isotopes between calcite and water might provide a means to estimate the temperatures of geologic events. Building on wartime advances in electronics, Alfred Nier then designed and built the dual-inlet, gassource mass-spectrometer capable of making measurements of sufficient precision and accuracy. This basic instrument and the associated extraction techniques, mostly from the 1950s, are still in use in many labs today. These techniques have become "conventional" in the sense of traditional, and they provide the benchmark against which the accuracy of other techniques is compared. The 1986 volume was based almost exclusively on natural data obtained solely from conventional techniques. Since then, revolutionary changes in sample size, accuracy, and cost have resulted from advances in continuous flow massspectrometry, laser heating, ion microprobes, and computer automation. The impact of new technology has differed by discipline. Some areas have benefited from vastly enlarged data sets, while others have capitalized on in situ analysis and/or micro- to nanogram size samples, and others have developed because formerly intractable samples can now be analyzed. Just as Stable Isotope Geochemistry is being reborn by new good ideas, it is still being nurtured by new technology. The organization of the chapters in this book follows the didactic approach of the 2001 short course in Boston. The first three chapters present the principles and data base for equilibrium isotope fractionation and for kinetic processes of exchange. Both inorganic and biological aspects are considered. The next chapter reviews isotope compositions throughout the solar system including massindependent fractionations that are increasingly being recognized on Earth. The fifth chapter covers the primitive compositions of the mantle and subtle variations found in basalts. This is followed by three chapters on metamorphism, isotope thermometry, fluid flow, and hydrothermal alteration. The next chapter considers water cycling in the atmosphere and the ice record. And finally, there are four chapters on the carbon cycle, the sulfur cycle, organic isotope geochemistry and extinctions in the geochemical record.